Some of the four alleged members of a banned British neo-Nazi group arrested on Tuesday for terror offences are serving soldiers, Britain’s defence ministry said. National Action became the first far-right group to be outlawed by the government in December last year, six months after the assassination of lawmaker Jo Cox by a far-right sympathiser. The four suspects are being held “on suspicion of being concerned in the commission, preparation and instigation of acts of terrorism,” British police said in a statement. 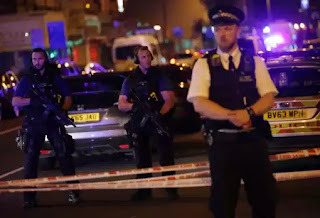 Authorities did not name the four but said they were aged between 22 and 32 and came from Birmingham, Ipswich and Northampton in England and Powys in Wales. “The arrests were pre-planned and intelligence-led; there was no threat to the public’s safety,” the statement said, adding that raids were also being carried out on “a number of properties”. The ministry of defence later said that some of the suspects were serving soldiers, but did not reveal how many. “We can confirm that a number of serving members of the Army have been arrested under the Terrorism Act for being associated with a proscribed far right group,” it said in a statement. “These arrests are the consequence of a Home Office Police Force led operation supported by the Army,” it added. Cox, an MP from the main opposition Labour party, was shot and stabbed to death in her constituency by far-right nationalist Thomas Mair in June 2016. Mair shouted “Britain first!” as he killed her. National Action, which had praised Mair’s actions, was banned in December of the same year. At the time, Interior Minister Amber Rudd branded the organisation as “racist, anti-Semitic and homophobic”. In June this year, van driver Darren Osborne allegedly mowed down Muslim worshippers near a London mosque, leaving one person dead. Prosecutors said Osborne was “motivated by extreme political views and a personal hatred of Muslims”. He is currently in custody awaiting trial.